ERCIM is based on a model of one member per country, each acting as a node linking academia and industry in that country and - via the other ERCIM members - to other countries. 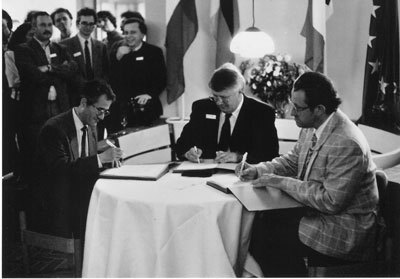 ERCIM can be envisaged as a high-speed linking network connecting and supporting researchers across Europe. ERCIM is open to anyone wishing to participate in the thematic working groups and the related workshops and R&D projects, or wishing to publish in ERCIM News, all via the relevant national member or the Office. Based upon this robust structure, ERCIM has helped develop and support European-centric multinational communities of high quality in particular subject domains within ICT and applied mathematics. These communities have achieved significant, high-quality, cooperative research across academia and industry from 'blue sky' research to highly applied development. To take just a few examples in which ERCIM has played a major role: digital libraries (DELOS, DILIGENT, D4Science, DRIVER); Grids (CoreGRID, GRIDCOMP, TrustGRID, ECHOGRID); WWW (projects leading to SMIL standard, SVG standard and early work on database/Web interfaces); trust Security and privacy (TRUSTCOM, i-TRUST, GRIDTRUST, PRIME); heterogeneous distributed database integration; software engineering including formal methods across embedded and wide-scale platforms; and user interfaces (UI4ALL, SESAME). This has extended into many application areas, examples being: biomedical (ACGT, VPH); environmental (DECAIR, THETIS, SIMES, CRUCID, TELEMAC, ANFAS); educational, cultural and multimedia (AQUARELLE, VITALAS, MUSCLE, PALETTE). ERCIM has put in place an ambitious postdoctoral fellowship programme hosted across ERCIM institutes, to increase European cohesion and the supply of well-trained and experienced researchers. The Cor Baayen award for a promising young is given based on open competition Europe-wide and thus encourages young researchers. ERCIM focuses the experience and ideas from a wide European constituency and, informed also by international interactions outside Europe, provides advice on strategic directions in ICT and applied mathematics to the European Commission (BEYOND-THE-HORIZON, INTERLINK) and other organizations. ERCIM has undertaken consultancy contracts for the EC, and has acted as the EU representative in workshops and discussions with the USA NSF (National Science Foundation). Past activities have involved the Mediterranean region, with more recent activities focusing on India and China. Senior ERCIM researchers have acted as experts for the EC on strategic issues (eg GRIDs) and as reviewers. ERCIM News - which is very widely read (in print and online) and which attracts influential personalities to write the foreword of each issue - has become the 'must read' publication in ICT and applied mathematics R&D in Europe (and beyond). The ERCIM Web site has a high page ranking and is much visited, giving ERCIM a high publicity profile. To ensure the relevance and quality of our work, ERCIM has set up an external advisory committee of independent highly respected members of the international community to advise the President and Board of Directors. 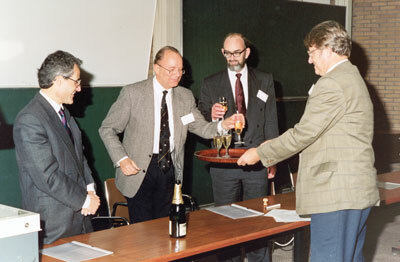 ERCIM has set up strategic partnerships with ETSI (European Telecommunications Standards Institute) and EMS (European Mathematical Society), with early tangible results (the Infinity Initiative seminar series and a special issue of ERCIM News respectively) and evolving plans evident in each case. 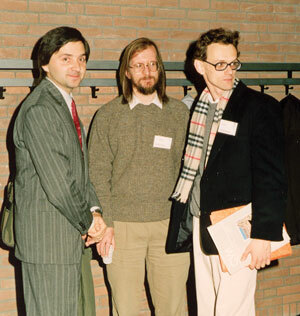 ERCIM took over from INRIA the responsibility as European host of the W3C (World Wide Web Consortium), and is contributing strongly to the development of the Web in both technology leading to standards and the increasing utilization and take-up in Europe through awareness, education and support. ERCIM has in recent years emphasised innovation, and knowledge and technology transfer, building upon the more than 200 spin-out companies from ERCIM members and associated products and patents. A strategic seminar programme engages with industry on topics in which ERCIM can offer research and development expertise. A new publication, 'ERCIM Innovation', showcasing ERCIM R&D offerings but also containing articles on related issues such as venture capital and market analysis, was launched at the EC ICT2008 Conference. A network of innovation and knowledge transfer experts among ERCIM members, overlaid on the network of researchers focused through ERCIM, assists in the Europe-wide take-up of research from any one (or more) members for wealth creation and improvement in the quality of life. Furthermore, our work with W3C and ETSI allows early standardization of R&D, leading to a larger stable market for products and services. While achievements mentioned above provide the bare facts, behind these achievements are the people who make ERCIM what it is. I have the honour of following in the footsteps of a sequence of distinguished presidents, each of whom brought their own energy and style to the advancement of ERCIM. We now have a clear management structure. The Board of Directors considers strategic issues and represents the top management of the member organizations. It has Strategy Task Groups on Structure, External Relations and Innovation, each led by a vice-president. The Executive Committee manages the operational aspects of ERCIM and has Task Groups covering Finance, Projects, Human Resources and Public Relations. 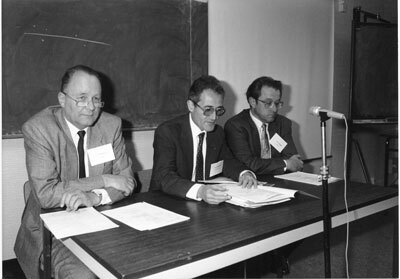 The Executive Committee coordinates three important aspects of ERCIM: the Working Groups, which run workshops, build communities and have research projects; the Editorial Board, which produces ERCIM News; and the ERCIM Office, which supports all areas of ERCIM activity including the management of projects. The past twenty years have seen amazing advances. We have moved from kilobit to gigabit communication bandwidths. We have seen the widespread adoption of personal devices from laptops to mobile phones connected anywhere. Sensor networks have appeared and data volumes have increased dramatically. Hardware costs have decreased and software costs increased. Systems and software engineering techniques have developed relatively little. The World Wide Web provided a stunningly simple but brilliant solution to sharing information. Linked with database and information retrieval technology for managing information, and with graphics for presenting information, it has revolutionised ICT. The early promise of AI (Artificial Intelligence) has not been realised, but robotics has developed considerably and some aspects of knowledge engineering (eg domain ontologies) have had demonstrable successes. Above all, the widespread use of ICT (and the underlying applied mathematics) in all contexts has been startling. The billions of processors embedded in everyday devices, the massive use of ICT for social interactions and the ever-increasing use of ICT for professional activities has amazed everyone. 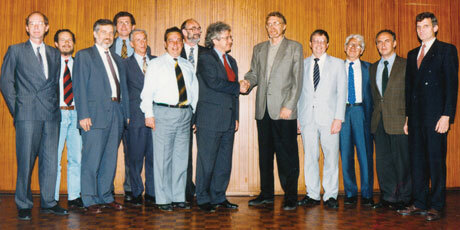 Dennis Tsichritzis, President of ERCIM (1994-1998) and the Board of Directors welcome the President of the Czech Research Consortium for Informatics and Mathematics, Jiri Wiedermann, during the ERCIM meetings in Zurich in May 1996. "Prediction is very difficult, especially if its about the future." 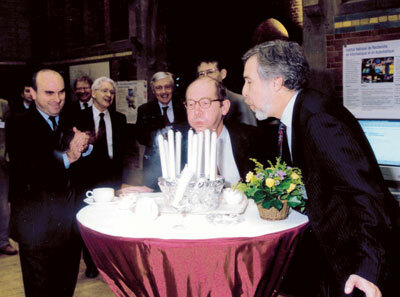 (Niels Bohr). However, at such a milestone it is more or less obligatory. It is clear that despite dire predictions, the limits of current processor and memory technology have not yet been reached and are being pushed further. On the other hand, newer hardware technologies are being developed in parallel with more speculative advances in quantum and biological computing. A connected world of ever-increasing numbers of sensors will also take shape. There are implications for the balance of media types: audio and video will become more prevalent. The future of software is much less clear. The move towards self-describing services that can be combined in a 'plug and play' mode (either by the software engineer or automatically) seems inevitable and is driven by factors of cost, reliability, security, durability and flexibility. Such a move should improve reuse of components and interoperability of application systems, with clear advantages for management. The merging of communications, location (spatial and temporal), media and processing will parallel the development of a seamless personal lifestyle across professional and social contexts, but we must be vigilant to the dangers to security and privacy. Intelligent environments in the home, office, factory, control room, medical centre, vehicles and so on will support this. Information supplied on demand by the user will evolve towards information pushed and filtered to the user - for whatever context and role is appropriate. User interfaces will move through haptic to 'brain-linked'. Evolution of ERCIM. 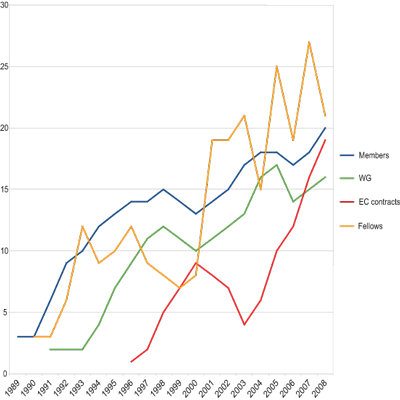 The graph shows the increase in ERCIM Membership, Working Groups (WG), European contracts managed by ERCIM and Fellows hosted at ERCIM institutes through the -Alain Bensoussan- Fellowship Programme. As it has over the last two decades, I am confident that ERCIM will remain at the forefront of developments into the future. Plans have been put in place for this to happen effectively and efficiently, and the people - young dynamic excellent researchers - are positioned to take over from the current senior generation. ERCIM has a great future.